This is the Campaign range of cabinets, tables and chairs manufactured by Sutcliffe Furniture. A light oak range which includes sideboards, display units, dining suites and also occasional items. A beautiful contemporary oak furniture range which has smooth lines and curves to add to the unique look and appeal. All made in the UK at the factory in Todmorden, Lancashire, the whole range builds on many years of the highest quality furniture design and development. All prices include VAT and it is free delivery across mainland England & Wales within 6 - 8 weeks, however we do carry large stocks of furniture in our two warehouses so if you need it sooner please contact us as we can often offer this. 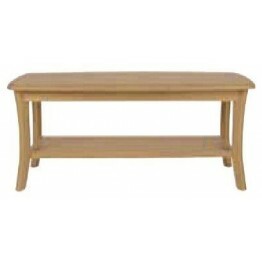 9145 Sutcliffe Campaign Coffee Table with a shelve between the legs.We have these available for quic..